To promote self recognition skills for your baby; the baby mirror toys are ideal. These are not like regular and huge mirrors but small and sized for babies with lovely graphics and characters to attract their focus at the same time. It is large baby mirror with Tru-Reflection to develop your baby’s vision. It features spinning ball with 2 colors and a bold red ladybug as well. Floor Mirror by Sassy promotes baby’s vision, communication, exploration and manipulation skills and it has beautiful characters such as ladybug and textures. Babies would love watching themselves and would like to play with those lovely characters. This large baby mirror promotes self discovery for babies. It has colorful fabric, crinkle leaves and beautiful characters surrounding the mirror. 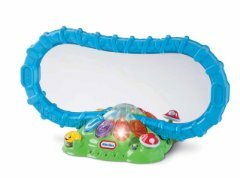 Floor Mirror by Bright Starts is great for baby’s tummy time and it promotes self discovery for your babies. 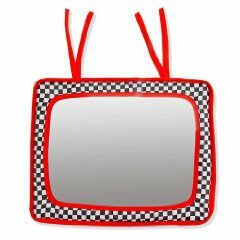 It has crinkle leaves on its side with 3D effect and this mirror folds down as well to store easily anywhere or to carry on travels. This teether toy provides your baby to play multiple ways with it. It contains different teething surfaces which also massage your baby’s gums also. 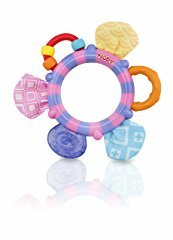 Look-At-Me Mirror Teether Toy by Nuby provides your baby with visual stimulation by its lovely colors and textures. It has soft teethers made from silicone to massage baby’s gums. It has BPA-free material. It features field of grass ribbons theme and it is designed for 0 years and above age. Its tuggable crinkle leaves and its playful patterns make it more beautiful mirror. 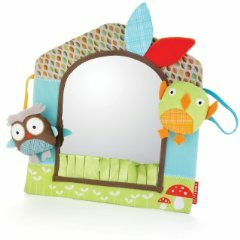 Treetop Friends Activity Mirror by Skip Hop is delightful baby mirror which can be used for tummy time as well. It features adorable characters including owl with wide eyes and the sweet birdie keeps baby focused and engaged. It can stand upright and can be folded flat and you can attach this mirror anywhere by using its loops. It is 2 in 1 mirror which can be used as horizontal for your crawling babies and tummy time and can be used vertical for grown baby/toddler. This musical mirror is perfect for both; babies can use its buttons as piano and toddlers can dance by and play. 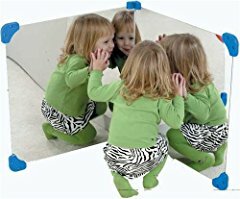 Activity Garden Mirror by Little Tikes is 2 in 1 mirror with horizontal and vertical position settings. It has music options and volume adjustment buttons. It can be used for years as; its horizontal position is ideal for your baby during tummy time they can enjoy playing music by pressing its buttons. Once your baby grows; the mirror can be adjusted to vertical position and it will become long mirror where your toddlers and grown up babies can dance and play on music. It is ideal for age grade; six months to 3 years. Its patterns are multi colored including black, white and red. Its one side has mirror and the other side has graphics with high contrast. It measures 14.5 inches x 10 inches and it is designed for newborn babies and above. 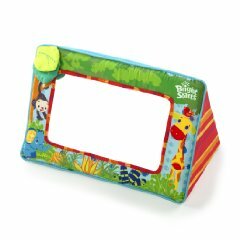 Baby Crib Mirror Infant-Stim is designed for your baby’s self recognition skills and it is double side in which one side is mirror and back side has high contrast graphics and it measures 14.5 x 10 inches in size. Your baby would be amazed to have an addition to his/her crib. It features a magic sensor which activates various melodies and songs and it promotes self awareness for baby. It can also be used as a crib toy and it has various features such as sliding fish and light up crab button. 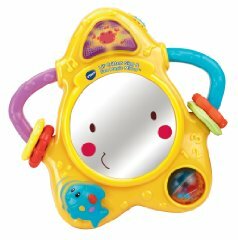 Lil’ Critters Magic Mirror by VTech lets your baby enjoy with music and sounds to build self awareness in them. This colorful magic mirror has various buttons, lights and sounds which encourage your baby to interact with it. It is designed for 0 to 2 years of age babies and it requires two AA batteries which are included. It is large reflective baby mirror and can be attached to crib rail easily. It is made from quality soft cotton cloth material. It is infant safe and designed for newborn and above baby. 2-in-1 Crib & Floor Mirror can attach to crib rails easily or can also be used as upright on the floor and your baby can have tummy time play. Its beautiful colors and design attract your baby’s attention to stay engaged. 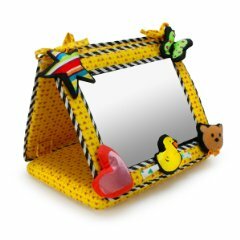 This mirror has an adorable lion face theme and it has a butterfly designed link to attach it anywhere. It can be linked and becomes convenient for travels and provides fun to your baby as well. Peek-a-Boo Mirror by Fisher-Price is lovely looking baby mirror which can be linked anywhere and baby would enjoy it. 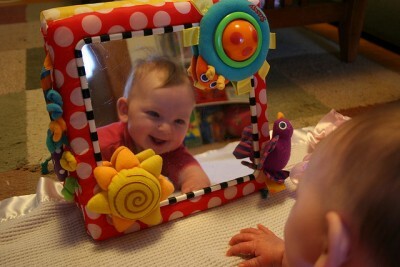 This mirror develops sensory skills in baby. 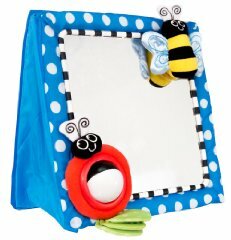 This two pair corner mirror is designed to build self awareness for your kids. The mirror has smooth edges and it is shatter-resistant as well. Pair Of 24″ Corner Mirror by Children’s Factory can be placed in any corner to build self awareness in your kids and it has smooth edges. It has simplified installation and it can hold against flat surfaces.